The Center for Teaching and Learning (CTL) seeks input for its annual Distinguished Teaching Awards, which recognize outstanding contributions to the instructional mission of the University. Based on over 51,000 student rating-of-instruction forms, eleven finalists have been identified for the 2013 awards. The selection committee is soliciting comments from students, staff, faculty, and alumni to aid in its deliberation process. Comments on the nominees are due by Saturday, March 30. The process for determining the Distinguished Teaching Award recipients from this list of finalists also involves the additional surveying of their classes. The selection committee makes the final determination of the award recipients. The recipients of the 2013 Distinguished Teaching Award will be formally announced in May 2013. For more information, contact Nancy Seely at 7-2046 or nsseely@mtu.edu . 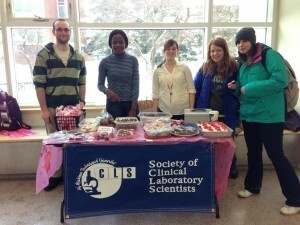 Clinical Lab Science student’s Valentines Day bake sale a success! 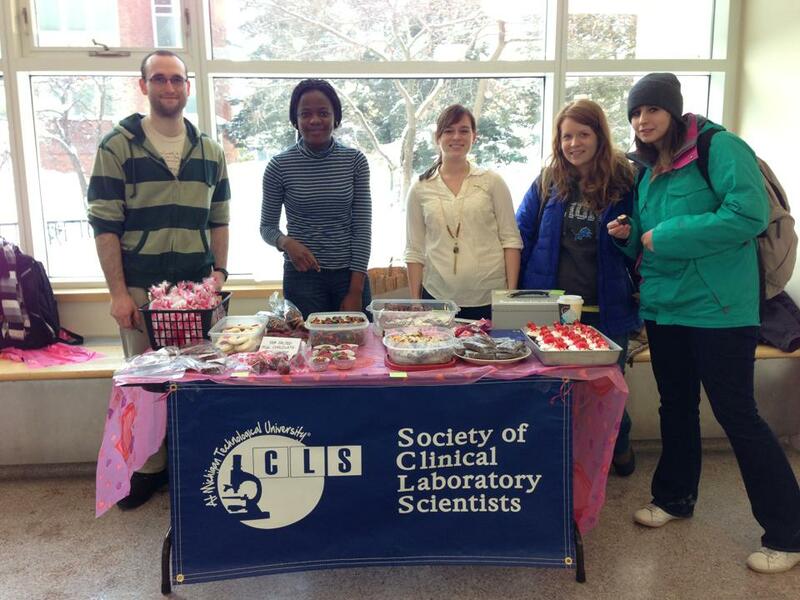 Students from the Society of Clinical Laboratory Sciences pose with their wonderful backed goods. What does it take to come to Michigan Tech? For me it took begging, nagging, complaining, and the occasional case of the Teary Eye Syndrome. It all started when I came to the U.P. for the first time, attending the SYP Women in Engineering Program. It was love at first, “Oh yah troll, don’t chyah know about dem pasties?” I am uncertain as to whether it was the gorgeous weather, the natural scenery, or the camp counselors that caught my attention and put Michigan Tech at the top of my list of colleges. My admiration for the campus only increased the next time I visited the campus for the Leading Scholars Competition. There is nothing quite like being in a room of 40 talented students who have the will and the potential to make a difference. Michigan Tech made the top of my college list by a landslide! My parents disliked the idea of going 600 miles away to a “tiny, engineering school.” They just didn’t know the magic of being a Husky—the adventure, the innovation, the ability to find something you love, do it, and be recognized as an individual. So, of course, I was signed up to attend orientation at U of M. I already had a roommate, and a full schedule of classes (This is where the crying part came in). I wasn’t upset simply because I didn’t get what I want, or because I feared I wouldn’t accomplish anything there, but there was no beating-heart-full-of-excitement rush to go there. Perhaps there doesn’t need to be this kind of enthusiasm when picking out a college, but since there was, it was something I could not let go. At this point I knew the friendships that I made both times visiting Michigan Tech would last a lifetime and that my heart was at Tech. Thankfully I got my way! We subsequently packed the car to the brim for my long journey ahead of me, and it turned out that the journey has been far longer than a 10 hour car ride north. By embodying myself with passion and immersing myself in campus involvement, I have become a part of something much greater than I could have imagined. Before the first day of classes, I already found a place for me—the electron microscope facility! I had taken a course in the subject and after following one of the workers around every week, they decided to just hire me. My job is more of an opportunity than a task as I have the privilege of preparing and examining samples from every single department on campus. The time I spend training countless graduate students, post-docs, other undergraduates, and even professors has enhanced my maturity, responsibility, and curiosity. The best part about my job is getting to interact and learn about the details of projects and labs that I would not have even heard about, had it not been for this experience. If this alone didn’t drive my interest for research, I don’t know what did. I was lucky enough to stay on campus for the past two summers, working, doing a summer research fellowship and taking classes. Aside from undergraduate research, I love to volunteer! My parents thought that Michigan Tech was the last place I should go as a pre-medical student. It hasn’t been hard to prove them wrong. Once a week I go to Portage Health to volunteer in the dialysis unit and shadow a physician. This is the absolute best day of my week! Moreover, I also get to help people firsthand as a medical first responder on the Michigan Tech EMS team. Both of these experiences have opened my eyes to rural medicine and further driven my passion and goals in becoming a physician. Lastly, I am honored to also be involved with the Executive Board of the Honors Institute, the Pre-Health Association at Tech, and the Phi Sigma Biological Honors Society. The magic is everywhere; everybody knows the feeling of being far away from Tech and seeing someone wearing Michigan Tech apparel, seeing a Husky license plate, or overhearing somebody talking about this wonderful place. It doesn’t happen every day, but each time it happens to me, I feel a surge of Husky Spirit! I start telling each and every person about my experiences. It is this spirit that the Huskies have, especially for WINTER CARNIVAL! Watch out, because superheroes, villains, and the like are going to take over campus, and I cannot wait to see what this year’s Winter Carnival has in store for all of us here at snowy MTU! Although this is my last Winter Carnival as a student, it will certainly not be my last Winter Carnival as a Husky. 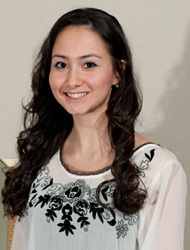 It is, without a doubt, a privilege to represent the Air Force ROTC as their 2013 Queens Candidate. I would also like to give a special thanks to the Blue Key Honors Society for hosting Winter Carnival and to Wells Fargo for being my merchant sponsor. Bring on the powers in these frozen hours!